The Joby GripTight XL GorillaPod Stand for Smartphones in black and sky blue allows you to stabilize your smartphone, letting you capture great photos and video. It's also suitable for viewing media or using your smartphone as a GPS device. The GripTight fits any phone 2.7 to 3.9" wide (including case). 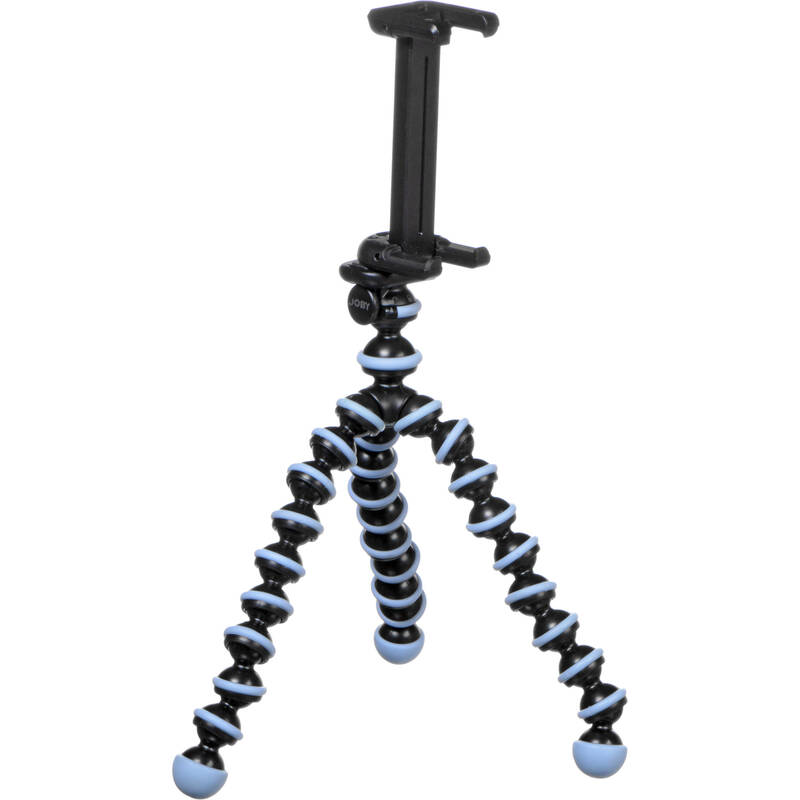 Box Dimensions (LxWxH) 9.5 x 7.9 x 2.5"
GripTight XL GorillaPod Stand for Smartphones (Black/Sky Blue) is rated 4.2 out of 5 by 13. Rated 5 out of 5 by Lhgolfer2 from Great iPhone Accessory! I like that I now can attach this to my iPhone and use it anytime when I need to take a picture from just about anywhere. It stands alone or can be attached wherever necessary. Rated 5 out of 5 by Ankaluv from Love it I use it with my iphone 6plus and it works great!! Rated 4 out of 5 by chilidawgnv from Works, but could use some tweaking This tripod works great as it's intended - for use in multiple positions, versatile, lightweight... I bought it to take use with my Nexus 6 and to take a long backpacking so i can hang it from trees and prop it up on rocks and whatever. That's all well and good. My only complain is that the griptight cannot be mounted centered on my phone because it presses down on the lock and volume buttons. I have to mount it to the far right of the phone which causes it to be a bit off balance. If the mount were adjustable so you could make it wider or narrower as needed, it would be perfect. Rated 4 out of 5 by rprp from perfect for bigger phones i called joby and asked if they were ever going to make a bigger griptight mount for bigger phones. my question was answered the same day that they were working on it. a month later i received a text that they have the griptight XL. very happy, great customer service and prompt delivery after placing order. i only gave it 4 stars because the legs on the stand are looser than the legs on my other joby products. Rated 3 out of 5 by RooDee from Cool Idea But A Bit Wobbley With My iPhone 6 Plus It's a fun product and a great idea and it looks cool. The only problem I've noticed is that it doesn't seem to hold my iPhone 6 Plus securely since the tripod legs are the same size as Joby for regular phones. Seems all they did was modify the screw on holder to accommodate larger phones but the legs are not very sturdy and I have to bend them way way way down in order to stabilize the Joby. Rated 4 out of 5 by saladman from Didn't read description Ah for some reason I thought XL meant Xtra Large stand and regular size phone case, so my phone doesn't fit. Other than that. I actually tried to prototype a similar product right before you released the GripTight. I gave up because it was so well executed. So congrats guys! Rated 4 out of 5 by Nicknamed from Good product Works well for what it does. Definitely tries hard to not bend or move. Instructions could be better so that I don't break whatever's on the top. A few words wouldn't hurt. Rated 5 out of 5 by Ponidoc from Love it!!! Does exactly what I need it to do. I attach my iPhone 6 plus, with an Otter Box, to it to a metal fence to video riding my horses. So glad I bought it!